Most people won’t buy something if it’s simply thrown in front of them, they need to be “warmed up” to the product and persuaded to purchase it. 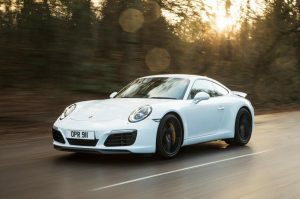 If you go to a Porsche dealership, the salesman isn’t going to point you to a 911 and leave, he’s going to try to sell you on the car by telling you why it’s awesome and how it would fit oh so perfectly in your garage. Landing/pre-sell pages function like a salesman for your offer. A typical landing page spikes the users interest in what the affiliate is promoting through detailing it’s benefits, why it’s great etc etc. Side note: a “pre-sell” page almost always referring to the page in between an ad and an affiliate offer, while a “landing page” or “lander” can signify both the interstitial page (pre-sell) or the page of the affiliate offer itself. Use context to distinguish between the two. There really isn’t one universally good setup for a pre-sell, it all depends on the offer you’re trying to promote. Landers for adult dating offers are typically going to be very different from those pre-selling a business opportunity product, lol. After clicking the call-to-action, in this case “Click Here Now to Sign Up!”, the user is taken to the Mate1 website, where they can register and net Affiliate X a conversion. A landing page like this one can dramatically improve an affiliate’s EPC and conversion rate. Unless an offer has a built in pre-sell page or a stellar direct landing page, a pre-sell will almost always drive up conversions when used properly. Like I said, most people won’t just buy something off the bat, they need to be sold on it. Direct linking, or simply sending a user to an offer without a pre-sell page, is actually quite rare. Affiliates over the years have realized the power of pre-selling their traffic, so nowadays you typically won’t see many direct-linked ads out in the wild. Back when I was a dumb newbie, I was too cheap to buy domains and hosting to setup a pre-sell, which was idiotic and a terrible idea. Don’t be like me, use a f*ckin’ lander. You must optimize both in order to get the most out of your campaign. Let’s give an example to demonstrate these two metrics. Affiliate X is running Mate1 and using his flirtsingles.com landing page. X sends 1000 clicks to his lander, and 100 of those clicks are interested enough to click on to his offer via his CTA (call-to-action) on the lander. Of the 100 clicks that got to Mate1.com, 20 clicks converted to leads. CTR and CR are basically useless when utilized independently, they must be analyzed together in order to get an accurate idea of a campaign’s performance. You can have a landing page with a 99% CTR, but if none of that traffic converts, the lander is crap. Do note though that the actual offer itself may also contribute to a poor CR, as even the hottest traffic will fall off when they get to a subpar product. This is why it’s imperative to always check with your advertiser or affiliate network to see which offers are performing best. Or, if one particular offer has multiple creatives (landing pages), ask which of those is working well for other affiliates. I hope by reading this post you were able to gain a least a basic understanding of what a landing page is, why affiliates use them, and how they function.